William Blyth in his book gives us the results of his extensive researches into the story of the Fincham family. He was able to study many old deeds, wills and the like, which had once belonged to the family, and were now with Sir Thomas Hare, Lord of Clackclose Hundred (this is an ancient title, a hundred being a Saxon administrative area intermediate between parish and county). Blyth traces several branches of the family in great detail, presenting extensive genealogies. The first part of this page is a summary of his conclusions. There is no doubt however that Adam de Fyncham, the “great man of the family”, and Attorney General to Kings Edward II and III, was lord of the principle manor of Fincham. He was born about 1270, died in 1338, and was buried in St. Martin’s Church. His relationship to the previous line of descent, if any, is uncertain. From Adam there is an unbroken line of descent to the eighteenth generation from Nigellus. They include Simon (or Symeon) de Fyncham, who paid for much of the rebuilding of the church of St. Martin, where he was buried in 1458, next to his wife. His heir was John Fincham, who probably built (or rebuilt) Fincham Hall. John is by far the most popular forename appearing in the family: so popular in fact that this John had two sons who were both given this same name!. The younger of these was the founder of the Outwell branch of the family (see below). Finally we reach William Fincham, who was a minor aged two on his father’s death in 1551. When he came of age in 1572, he sold his Fincham estates to his brother-in-law Charles Cornwallis. He left the village, and although he apparently had a son, there is no further trace of this, the elder branch of the family. The above-mentioned John the Younger went to Outwell (some miles to the west of Fincham) in 1458 on his marriage. His two sons headed separate branches of the family, though they were united by marriage in the fifth generation, when John Fincham of the younger branch married his cousin Mary Fincham, the only survivor of the elder branch. The Outwell family died out after two more generations of Johns, the last being the 22nd generation since Nigellus. See a separate page about the Chapel of St. Nicholas in the church at Outwell. 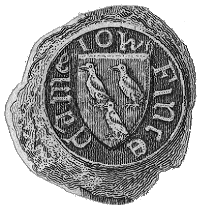 Blyth finds a number of Finchams throughout Suffolk from the end of the sixteenth century, though their connection with Fincham or Outwell cannot be established. John Fincham of Thelnetham was a considerable landed proprietor, “from whom we have a known and manifold descent”. Blyth places him at the 21st generation from Nigellus. He became a member of the Society of Friends (Quakers), and was buried in their burial ground in 1710. In this branch of the family the names of Benjamin and Zechariah now predominate over the Johns! One of John’s descendents, William Fincham, founded the Dorset branch of the family (south west England), and his son was alive at the time Blyth’s book was published. Blyth’s pedigrees span 780 years and twenty-six generations from the time of William II. The descent is uncertain only at two points: the connection between Adam de Fyncham and his predecessors; and the relationship between the Suffolk branch and the Fincham and Outwell branches. Fincham is an uncommon name in England, and most telephone directories list only a handful of Finchams. Not surprisingly, there is a larger number in Norwich, the county town of Norfolk. Are all present day Finchams part of the same family, descending from Adam de Fyncham and perhaps even Nigellus? Almost certainly the answer is yes: the Fincham family being so prominent in Fincham for so long a time, it seems unlikely that any lesser family would dare to adopt the same surname. Certainly there have been no Finchams in Fincham since William Fincham left in 1572, or Blyth would surely have known and commented on this. Although he was unable to establish the connection between the Suffolk and Fincham/Outwell branches, it is clear that the Dorset branch, deriving from Suffolk, did consider itself related to the Finchams of Fincham. A former publication from the 1990s, called The Burke’s Peerage World Book of Finchams, estimated that there were some two thousand Finchams in England, a similar number in North America, and a few hundred in Australia, New Zealand and South Africa. A number of Finchams from these countries have visited the village. The World Book listed some early Fincham immigrants to North America: William Fincham arrived in Barbados in 1685; John and Robert Fincham arrived in Maryland in 1740; Ann Fincham arrived in N. America in 1745, and Isaac Fincham in 1774. A number of Finchams are researching their own family history. We have established a page of Fincham family research to record their results and to provide advice and resources. The village was originally spelled Fincham, occasionally Finsham, but Phincham in Domesday Book. The Norman spelling was Fyncham, the family calling itself “de Fyncham” until the middle of the 15th century, and then just Fyncham. Sometimes this is written ffyncham: this is just a typographical convention. The Outwell and subsequent branches reverted to Fincham. This is the only spelling that is found in England today. Variant spellings found in N. America are Finchum and Flinchum. The presence of the “l” in Flinchum is suprising, but Willis Arnold Finchum mentions one of his ancestors who was known variously as Fincham, Finchum and Flinchum. The spelling Finchem is also known.